Are you shopping for vinyl floors for your home or business? Depend on the knowledgeable and friendly staff at our flooring company to help you choose top-quality vinyl flooring for your property. 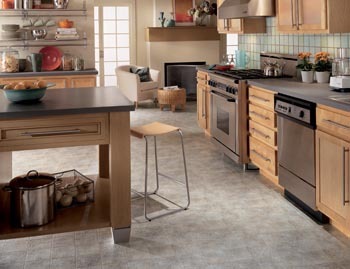 At our spacious showroom, we have many stylish and affordable vinyl flooring options. Add aesthetic appeal to your living area with vinyl flooring. Available in many varieties, this floor product gives you limitless options when you want to redo your floors. Because this type of floor takes advantage of 3D printing technology, it creates amazing depth and realism that even fools your most observant guests. They may think you actually have wood or stone floors. Allow the flooring experts at our store to help you choose the perfect flooring for your next project. Our local store is well-known for its premium, yet budget friendly flooring. You can find exactly what you need when shopping with us. Allow our skilled flooring team to help you with your selection. We’ll answer all of your questions about the impressive vinyl floors we have. In addition, we can also provide vinyl flooring installation and free room measuring. Popular among homeowners due to its versatility, affordability, and durability, vinyl tile flooring is the ideal choice for kitchen and bathroom applications. That’s because these types of floors resist both water and stains, and they provide excellent strength. The quality and durability of vinyl has advanced significantly throughout the years. Choose from a wide array of colors, styles, and patterns to suit your needs. Vinyl tile and vinyl sheet flooring are both economical and attractive flooring materials. Get the look you want in your home at a price that is feasible for you. Now, you can have a high-quality floor that looks just like different types of hardwood, yet it is virtually impervious to moisture and water. Vinyl plank flooring is often the product of choice for frugal and style-focused customers. Available in all colors and varieties, this flooring type offers endless options. Using advanced photographic technology, your new floor can look just like hardwood, stone, or ceramic. It is also easy to install and maintain. Ask us about our installation services that ensure a beautiful floor for many years to come. At our flooring store, we not only sell premium vinyl tile flooring, but we also perform quick and efficient vinyl floor installation services for commercial and residential customers. Because we always strive for 100% customer satisfaction, we work around your busy schedule. After all, we don’t want to disrupt your home routine or your business day. So we are in and out as soon as possible! From bathroom tile installations to entire home remodeling jobs, we handle a wide range of projects. Best of all, we guarantee flawless appearance and long-lasting quality. Once you have made your purchase, ask us about our specials on installation options for your new vinyl floors. We make flooring shopping and purchasing easy and affordable for our customers. At the same time, we offer our customers an Ultimate Confidence Guarantee with their purchase. If you do not love your 4 or 5 Star floor after 30 days of installation, we will replace it for you. In addition, if you ever have an installation-related issue in the future, we’ll correct it for free. That’s how confident we are in our products and services. Whether you are planning to sell your home or you plan to live in it for a long time, a vinyl floor is a fantastic way to breathe new life into your living space. These floors add value and appeal to any room. At the same time, if you are business owner, you can use a vinyl floor for high-traffic areas. It is not only attractive but it is durable – lasting for years. For a free estimate and for personalized assistance, stop by our flooring showroom. We’ll be happy to help you choose a floor that meets your needs and your budget. Contact us for more information about our special guarantees. We proudly serve customers in Feasterville, Holland, Southampton, Warminster, and Willow Grove, Pennsylvania, and the surrounding areas.